Interviewing Eddy Medora of the Sunrays is like revisiting a virtual who's who of the LA rock scene of the early to mid '60s. 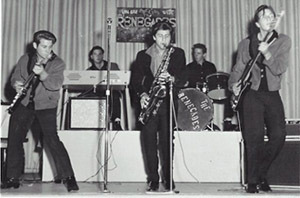 Not only did The Renegades [the pre-Sunrays lineup] record with legendary producer Kim Fowley, but also the band was signed and managed by Murray Wilson [Father of the Wilson brothers in the Beach Boys], changed their name to the Sunrays. Not only did the band play the Hollywood Bowl, but they even went on to record with the 'wrecking crew' at Goldstar! It was fascinating to hear Eddy describe the early rock scene in LA and his budding friendship with the Beach Boys [Carl especially]. He described what it was like to work with Murray Wilson. In fact, I got some rare insight into the character of Murray, who is often demonized in Beach Boys lore. Eddy was there when David Marks was fired from the Beach Boys, and he related that story. Finally, through Dennis Wilson, Eddy had an encounter with Charles Manson! It all sounded like a great episode for one of those rock star 'tell alls' on the E! television network, or at least a very interesting book. In fact, I found out during the interview that Eddy IS working on a book. When I interviewed Eddy by phone, California was right in the middle of a wildfire, with Eddy's home being less than a mile from the danger area. But, they were never given the evacuation notice, so they were spared the fire. Even though all this must have been on Eddy's mind, we ended up talking about an hour and a half on the phone, covering A LOT of information. So much, in fact, that I've decided to divide the interview up into two segments, covering Eddy's band The Renegades in this issue and covering the Sunrays in the next. This issue will end when the Renegades pass an audition for Murray Wilson and are signed as The Sunrays. E.C. : On your CD "Ride Ride Ride" there are 5 newer songs and 10 older songs. First I wanted to ask you about the older songs. I hear a sax, and you played sax with the Renegades, correct? Eddy: Yes, you hear a saxophone…any of the Sunrays/Renegades/Rangers, whatever group I was in, that was me on the sax. I also played guitar on a lot of the stuff like "Sidewinder" - I played lead guitar with Chris Gordon on "Ski Storm". So, I switched over at that point. My main thing before the Sunrays was the saxophone. E.C. : Now these 10 older songs, were they recordings by the Renegades? Eddy: Yes they were. Do you have a copy of the box set? Eddy: All right, when we are done here, I will send you 3 CD's of every single we've ever recorded. The "Ride Ride Ride", if you hear the first three songs on there, that's Freddy Cannon and me. And I'm playing the bass and guitar - he's playing rhythm. He's singing lead and I'm singing harmony with him. We were writing songs NOT for Eddy Medora or Freddy Cannon, we were writing songs for other artists. "Marlena" was almost recorded by Carlos Santana. He asked not to give it to anybody for at least 6 months so we didn't. We froze that song. Then one night a letter came, I got a letter and a phone call from Jorge [Carlos Santana's brother] and said they were going to go in a different direction after "Supernatural", but thank you. "Gimme Some Love Tonight" was going to be like for Cher, we got that out to her people. So, we're writing for other artists. I have a Harley thing, so I wanted to write a biker song with Freddy [the song "Ride Ride Ride"]. And we solicited to Peter Fonda and George at Glendale Harley for the "love of your ride" last year. What they did is they went to Capitol Records and had Capitol Records put a whole compilation together for the "love ride". I thought it would be a good thing, and I said I had plenty other biker songs if they wanted it. But what we were gonna do is just give the whole CD free…not get anything. And we were gonna press up 30,000 and we were able to write off the thing as a business deal. They didn't buy into that at all. It was a cool song and we had a lot of fun recording together. E.C. : Now, is that why there are two versions of "Gimme Some Love Tonight"? Eddy: "Gimme Some Love Tonight"…the one with the techno was supposed to be for Cher and that type of dance…European dance. The other slow version was supposed to be just a regular rock 'n roll version - we didn't have anybody in mind for that. I have about another 30 that Freddy and I have written together. But I haven't pressed anything up, or burned any masters at all. E.C. : Talking about the older songs, when were those recorded? Eddy: "Sidewinder", probably…(laughs) 1959-1960 with the Renegades. The guy that recorded us, his name was Larry Marks and he invented the echo-phonic for Fender. And he became a huge producer for A&M Records down the line. And I wished I had known that when I was at Disney - that Larry was that big of an engineer, recording the Carpenters…Joe Cocker and all that at A&M Records. He engineered "Sidewinder"/"Renegade? - that was our first instrumental that we were able to get down on actually vinyl then. E.C. : So that would be the early lineup of the band? Eddy: That's why I have to send you the box set. CD 1 is all of our garage band stuff. CD 2 is a lot of the Sunrays stuff, stuff that we were gonna put on our album and CD 3 would have been our second album if we did put one out. It's about 3 hours of music and you hear the transition from a 2-part harmony, 3-part harmony and then the Sunrays' 5-part harmony - to more of like the Beach Boys or Lettermen, the Four Seasons or even the Four Freshmen. On the 3rd CD was pretty interesting harmony before we disbanded that we were able to do. We worked really hard at it. Eddy: Thank you! Yes! We'll what happened was, we were a blues band. Our repertoire was B.B. King, Ray Charles, T-Bone Walker, King Curtis…emulating these guys that were really just very unique musicians in experimenting with music. And they were our mentors and that's what we loved to play. There's a thing on the box set called "68 Blues" and all we do - it's a blues riff and we each take a solo. It was sort of cool, though, because when we started to do the Sunray gigs…we'd pull on of those songs in and the audience would freak out and say, 'what are you guys playing that kind of stuff?' And we'd go back and say, 'that's what we were weaned on'. So, our musicianship actually…we were better than a lot of bands around. Singing - we had to catch up to after we were managed by Murray Wilson and he made sure that we were able to sing 5-part harmony and do it well. E.C. : The song, "Tired of You" is the only song that sounds like the Sunrays, because of the harmonies. Eddy: Right…that was the Sunrays. And the reason why I put 'Eddy of the Sunrays' is because I wrote all those songs. I sang, "Tired of You" and I played guitar on 'em and I got all the publishing on most of them…or share the publishing with somebody. And I have another Volume 2 that I haven't put out yet, of stuff that I've written that has never been released and some that has - that I'm going to be putting out shortly. I figured it's not doing me any good having that stuff in my garage! I enjoyed recording it way back then. And now with the technology you can clean it up pretty nice and put in on a CD, those old acetates. Yeah, that was the "Tired of You" that I put on there to show a transition, to show that you can go from "Renegade"/"Sidewinder", a biker song, a techno song. Eddy: That's when we started….we started we were all in 8th grade and saw this band called the Riptides and we went nuts over them. I'd love to find that record, "Machine Gun". I forgot what label it was on, but it was a local hit here in LA. I said, "I'm gonna start a band." So I started a band and we got a couple of guys together…a couple of guys left. Ricky stayed…Marty stayed and of course I stayed. We named ourselves the Renegades. So we played all through west Los Angeles. You know, Malibu, Pacific Palisades…we played at all the fraternity parties at USC. We were like the house band. Just every weekend we were booked. The Renegades actually sort of…then Kim Fowley, who was unknown, said, 'Let's go in the studio and let's do a record.' And I couldn't get all of the guys together to do the "Ski Storm" thing. So we cut "Ski Storm" with Dave Holt, Steve Gordon, Byron Case. We did a record called, "Snow Skiing". And we also did one called, "Mogul Monster" - it's one of my favorites, it's an instrumental. It's a ski thing that comes down the side of a hill. Steve O'Reilly was playing with the Renegades prior to the Sunrays…he left the Sunrays when "I Live for the Sun" started to break. He said, "I don't wanna be in the group anymore, I think I can make it on my own." And he's passed away since. I think he was smoking in a van and it caught on fire and he burned to death, which is a tragic way to go. But what a guitar player this man was. He could do anything back in the old days. He could just play hours a day and right after school. We got some decent airplay on that, and again we were the Renegades posing as the Rangers, posing as the Snowmen. E.C. : Did the Renegades have any TV appearances? Eddy: No…close though, close. The teenage fair at Burbank and boy I wonder if they ever did film that. It was with Jan & Dean and the Renegades at that time. We were just young kids, we didn't know where we were going with this thing. But we loved playing instrumentals - we found out later that you have to sing and do vocals as well. 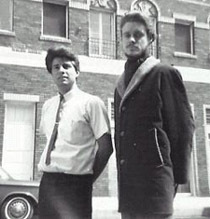 Right: Eddy with Kim Fowley who produced many of the early songs by The Renegades. E.C. : Now this is the same Kim Fowley that went on to produce the Runaways in the '70s? Eddy: Yep…we grew up together. We'd have Sandy Nelson come over to my house…and we'd have Danny Hutton of Three Dog Night come over to my house. A lot of friends would come over to rehearse. Dino of Dino, Desi and Billy would come over. And of course I know Billy Hincshe from Carl Wilson. But anyway, the Renegades was a nice, we loved performing. We didn't go out for sports…I went out for football, but none of the guys went out for sports. So, on the weekends, when we weren't working we'd lock ourselves till 2 or 3 in the morning and rehearse and try and write. E.C. : Did the Renegades do any gigs with the Beach Boys? Eddy: Yeah, it's interesting that you bring that up, that's never been asked. I thought of that the other day because…The Renegades - we were the house band at Dykstra Hall at UCLA for 2 summers in a row. So, all the sudden the Pendleton's show up…Carl and the guys, with Dave Marks. And they played one gig with us. "Surfin" was just busting out and so they changed their names to the Beach Boys. So yes, we played together but we didn't know each other at that time. That was the first and only time the Renegades played with the Beach Boys. Then they heard us, Carl came to Hollywood Professional, the school I was going to. And every Friday you were able to perform, whether you were an actor, actress. We would perform. And Carl went CRAZY. Carl and Dennis went absolutely bonkers over our band. He said, "My Dad's looking for another band," and I said, "Yeah, you just want you Dad off your back!" Which was probably part true, I found out later on. But he was looking for another band to manage. E.C. : I read that the band auditioned for Murray at his house. Can you describe what the audition was like? Eddy: Oh, it was frightening! First of all, I kept setting Carl up with these girls. So I said, "when are you gonna introduce us to your Dad?" "Oh, Dad's been busy, Dad's been this, Dad's been that". Then he said, "Why don't we go to the prom again?" I said, "Carl, I'll set you up with the girl you wanna go with." He bought me a tux, shirt, shoes. He went out and bought a brand new 1964 Grand Prix, white leather seats, turquoise blue. And it was just incredible, a fun time. Anyway, we played probably 4 or 5 of our best songs. We actually set up our own equipment, he said we didn't have to, but we did. He said, "you guys are great. But the singing isn't up to what I'd like to hear." He was trying to sing a chord to us, a 5-part harmony chord. We hit it, but we had to learn how to blend on a mike so you don't hear my voice louder than Marty's or visa versa. If you are gonna do 5-part harmony, you are going to have to sound like one. So, we were learning like crazy. By 2:30 in the morning, he said, "this is the deal…if you listen to me, you'll have a record in 6 weeks. You guys go home and think about it, it's gonna be tough. I want you to go home and write, and write and write." So that's when I wrote "Jo Ann" and "Tears In My Eyes". I had a song called, "Run Run Run" and Ricky called me up to come over and finish it. And I didn't come over. And "Run Run Run" is the same hook as "I Live for the Sun". And Rick finished it, basically he wrote "I Live for the Sun" with the idea of "Run Run Run". The name of the group, they didn't like the Renegades because it sounded rebellious. And Murray - that wasn't his thing. They thought the 'Souvenirs' might be good, but we all said, "oh no, no, no, no". Then Eddie Ray who was the A&R person for Capitol Records said, "How about the Sunrays? You know, with your song, 'I Live for the Sun?" I said, "but that sounds like underwater by the frogmen." And they all laughed. Then they said, "now what label are you gonna be on?" We are already recording at Goldstar. They said, "you can't put them on Capitol because they're gonna compete, they are gonna sound like your sons. Consumers will get all messed up, the promotion guys will get confused…" So this went on and Alan Livingston and Murray said, "we'll just start a new label." And that's where Tower Records came from. Designed just for the Sunrays group. E.C. : But it was through Capitol? Eddy: It was actually Capitol Records under a different name. In England we were on Capitol, in Canada on Capitol. Everywhere out of the United States we were on Capitol Records. In the United States, we were on Tower.